Anyone who has experienced debilitating neck pain knows it has an adverse effect on the quality of your life. While it is tempting to reach for ibuprofen the minute symptoms appear, it is worth determining the cause of your neck pain to determine the root of the issue. Chiropractic professionals, who determine and treat the root of the pain rather than the cause, are an essential component in any long-term pain relief plan as they are experts at not only reducing pain but also preventing issues in the long term. Neck pain is any pain that occurs in the region between your neck and shoulders – all the way up to the base of your skull. Fortunately, while neck pain is a common complaint affecting most people seriously at least once in their working life, the causes of pain are often harmless, treatable, and preventable. Our modern lives are often to blame. If you think about how a typical user operates a computer or uses a smart device, they are often hunched over. When we pick things up, we often disregard healthy practices and instead put excessive force on our necks. Even gym rats can be guilty of doing this when they lift heavy weights using an unsafe technique in a quest to lift more than they can handle. 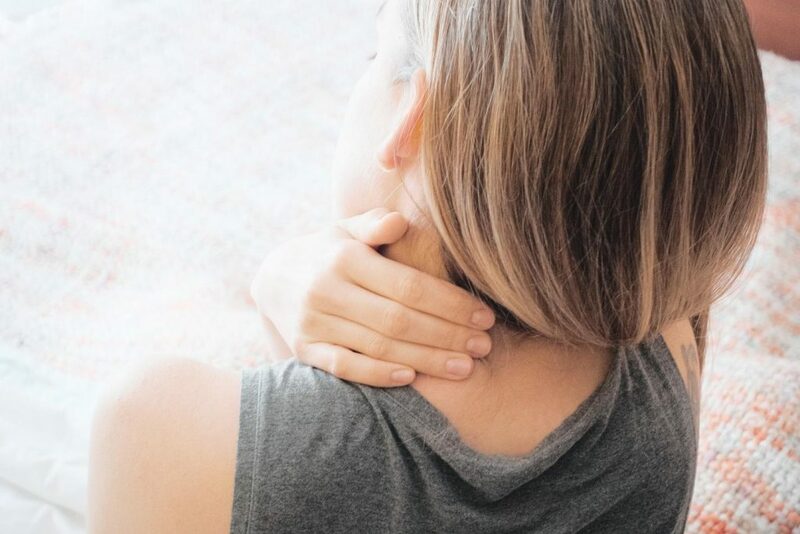 Neck pain can also be caused by a sudden event, such as lifting a piece of furniture and consequently suffering a strain, or slipping and hitting your neck on furniture. There is also a rare class of neck pain symptom, which indicates serious conditions such as cancer. Don’t let this possibility scare you. If you’re experiencing neck pain, then statistics show your poor habits were most likely the cause. The neck, shoulders, spine, and head are complex structures that work together for optimal health. Because of this, the first thing you should do when you sense pain is to seek a professional opinion. A chiropractor is a health professional who specializes in the health of your spine and whose job it is to not only adjust your spine into alignment but also observe and point out any bad habits you may practice that are unwittingly contributing to your pain. Preventative care is a large component of the chiropractic philosophy and is the number one reason why return patients find it an attractive addition to their health care regimen. Importantly, they will provide qualified advice on how to avoid further complications as you age. Depending on the clinic, they may provide a range of other services that complement your journey to positive health, such as nutrition advice. When you make an appointment with a chiropractor, they will first listen to your complaints of pain, observe your posture, check your spine, offer recommendations, and provide alignments. Alignments mean the physical adjustment of your system in a pain-free way. Those who have had chiropractic for neck issues often report instant relief, as though something was physically pushing on what was causing them pain. Research shows that simple postural-related neck pain is relieved with a regular series of gentle chiropractic alignments. Chiropractic releases the stress that builds upon the neck and head area, as busy people often store stress in the head region. Also, chiropractic is a drug-free approach. This means you won’t have to pop pills daily and you won’t have to worry about stocking your office drawer with a supply of medicine should your neck ache again. The practice of being aware of your own body and the effect of your posture on your health is similar to the practice of mindfulness, which is renowned for its positive effect on health and wellbeing. Chiropractic has a positive aspect on all aspects of your health, as you become aware of the effect all of your choices have on your life. A choice that may affect neck pain is whether you willingly overwork – will you reduce your work hours and adopt healthier habits in the office to have a healthier body? Ongoing education into healthy habits is a great side effect of the chiropractic method. Further, your chiropractor will hold you accountable for making positive changes – motivating you towards taking responsibility for your health. A positive preventative approach, along with the guidance of your chiropractor, is the right way to obtain a healthy body that lasts a lifetime. This means exercising daily, drinking enough water, getting out into the sunshine regularly, practicing healthy breathing techniques, eating enough vitamins and minerals for bone health, and maintaining a healthy posture. If you’re unsure of what a healthy posture means for you, or you don’t know what it takes to maintain it, contact your chiropractor today for expert guidance.